Having recently received a little goody box from SugarShack I decided to have a go at making some cute little Halloween cupcake toppers. In my pack I received some pastel green, black and orange Renshaws fondant, some fab (by fab I mean they don’t fade in colour and don’t peel) quality black cupcake cases, funky pumpkin inspired cupcake wrappers, an edible black pen, edible glue and I added a few of my own things in there too of which you can also buy on the Sugarshack website – round cutters, tylo powder, star cutters and some paprika (for the skin colour) sugarflair gel. (PS: If you didn’t realise Sugarshack also offer free standard delivery on all orders over £15). I don’t make fondant models very often so I had a good nosy around on Google images and Pinterest (I’m addicted to Pinterest by the way) for some inspiration and something simple to do! My favourites were from Gill’s Cupcake Corner and specifically (& where I picked up this design from) the ones from The Yellow Bee Cake Company. Anyone can recreate these toppers, they are very easy and you can choose to mix up your own colours, you don’t have to stick to green and black like I did. I just really like these two colours together. Black fondant can be a bit tricky to work with as it shows up any little mark or speck. To make this easier I use a non-slip mat and cornflour. You can use icing sugar if you prefer, but the marks from this are difficult to remove and you need a lot more on your mat than you do cornflour. Also, rather than add any cornflour to the top of your fondant when rolling out, just rub a tiny bit on your rolling pin too. You don’t need much at all. If you do decide to make these models, or any models in fact, a tip from me is to treat your fondant with tylo powder before you are going to use it. I add 1/2tsp per 250g of fondant and tightly wrap or store away in a Tupperware box to stop it drying out. I find black fondant takes a little longer to set so you can make these toppers quite far in advance if you need to. Are you baking for Halloween this year? 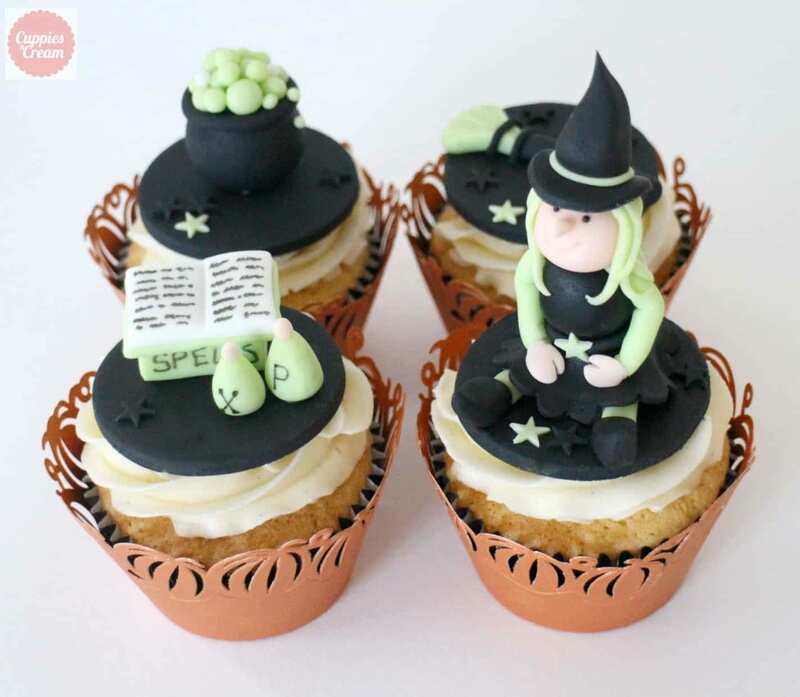 Do you have any spooky cakes or cupcakes planned? Last year I baked Pumpkin and Cinnamon cupcakes and you can find the recipe here. Is there no end to your talent?! They look great..